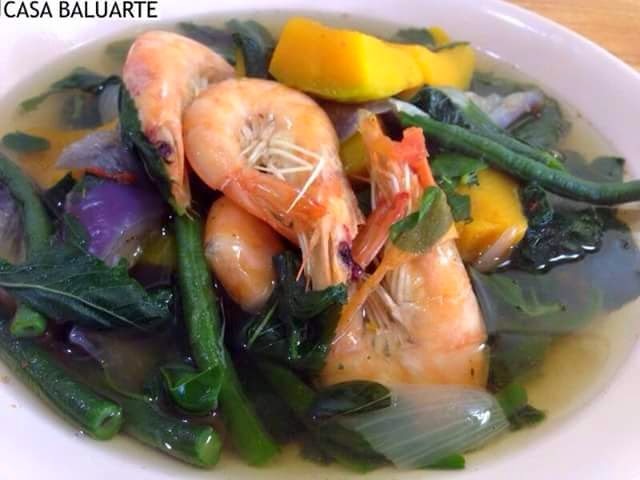 What can be better after all those yummy fatty food consumed during the holidays but this stewed vegetables in shrimp. An Ilonggo dish that is my family's favorite. Boil water in a deep pot. Once the water starts to boil add the tomatoes and the shrimp. Season with salt (to taste) and a dash of ground pepper to taste. Reduce heat to medium low to avoid from over flowing. Now start adding the vegetables starting with green beans, okra, eggplant and kalabasa. You don't need to cover the pot. After few minutes add the malunggay and saluyot leaves. Remove from heat and serve with lots of steam rice.